In one of the worst timed gaffes in history President Obama stuck his foot in his mouth last week. In either a fit of delusional fantasy, an act of ultimate denial or just trying to channel European socialist Obama declared the private sector was doing just fine. To add to this, he declared unemployment was due to state and local government not hiring enough. This is something one has come to expect from the likes of Joe Biden but not the MSM’s Mr. cool. 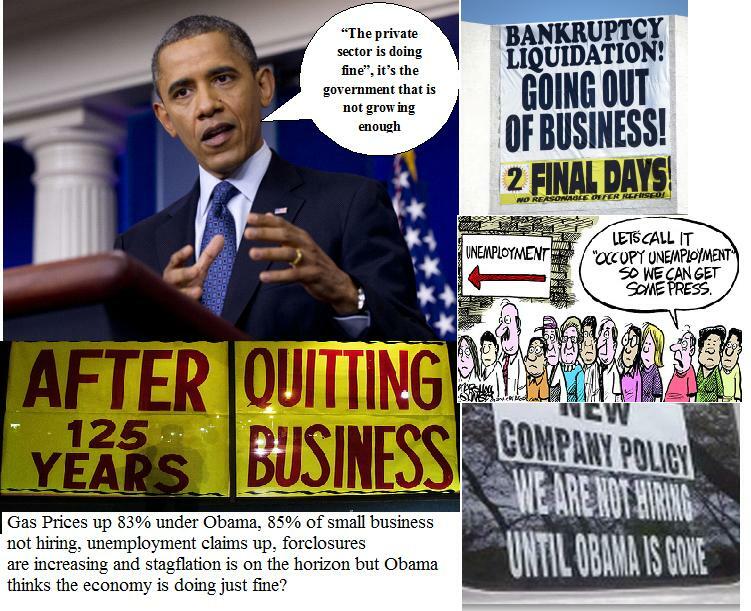 The President seemed to be saying the private sector of the economy falling apart was okay! His main concern was the lagging growth of government, especially at the state and local level. With President Obama sounding more like France’s new socialist president than leader of the world’s foremost capitalists country the GOP was quick to pounce. Some might want to think President Obama admirable for his sticktoitiveness and willingness to go down with his ship but those on that ship might take exception. Although he has since backtracked to avoid some of the political backlash his words still speak of a man out of touch or too ideologically driven to fully comprehend the mess he is suppose to be helping clean up. As previously noted, the numbers coming out of the White House belie the true depth of the economic situation the country is facing. Presently 23% of small business owners are working without salary, that’s nearly 1/4 that are on the verge of failure. The combined unemployment/underemployment figures are flirting with 20% and the workforce is down to 1983 levels. If this is fine by Obama’s definition people must be asking what he would consider bad? The fact is the United States is on on the verge of a very serious precipice that the President’s policies are pushing the country towards at an ever increasing pace. Insolvency is now within sight and stagflation is starting to rear its ugly head. A former premier of the Soviet Union declared the United States would be defeated from within; economic suicide was probably not what he had in mind but his words seem to be coming true! As all this is happening the President seems to be living in an alternate universe. He is standing steadfast against extension of the Bush era tax cuts, a move that is nearly universally seen as disastrous by economists. Even former President Clinton declared this one a no-brainer (something he later apologized for as it appeared he was opposing the President). By all accounts the centerpiece of a second Obama term would be global warming legislation. Apparently the economy and the looming national debt would be of no more importance to him in a second term than they are now. In President Obama’s world unemployment does not matter nor does a secure energy supply or the ability of the country to defend itself. If the country is nearing a brick wall of unsustainable debt what of it? To him sacrifices have to be made for the greater good of obtaining his utopia of a greener and more socially just America. He is the doctor and his patient is the United States and he is bound and determined to cure what he things ails her even if it kills her. The President obviously needs a reality check. Unfortunately, the likely hood of this happening is infinitesimally small. He has lived in an alternate far left universe all his life. He is a man who was raised in socialist bubble detached from normal American life. He went to private schools, was mentored by a infamous communist poet and hung out with Marxist at the country’s most exclusive universities. With such a past he has no more of a understanding of America then someone who grew up behind the Iron Curtain, probably less. Having grown-up detached from normal American life, he has no idea what the average American thinks or what they are like. Without the insight that such knowledge gives he is forced to rely on his ideology and prejudices to guide him. As much as the President needs a reality check it is also time for the American people to wake up. They have supported the President and his reckless policies for most of his term in hopes he knew what he was doing. It has come time to accept he doesn’t. Former President Clinton said two years ago that the American people need to give the Democrats two years to get things going and if it doesn’t work they should throw them out. It is time for the people to accept that Obama and Democrats are over their heads and do as President Clinton suggested. Excellent Post – Although I think you are still too soft on our President. His socialist/environmentalist policies killed over 200 million people last year century and they don’t even feel the need to apologize for this. Dale, thanks for the comment. I probably would not hold Obama personally responsible for the deaths caused by the left for the last century although he likely supports the policies that led to them. As far as apology, I am sure most who were the driving force for polices like banning DDT in malaria prone countries and forced relocation and reallocation policies that led to much of the misery in the third world (not to mention deaths caused by the likes of Mao and Stalin) feel they have little to apologize for. In the world of moral equivalency and with a planet they see as over populated anyway the idea of a few deaths (or a few million) is of no consequence. Click here for link to a video you might find interesting. It shows where Hitler got his ideas of mass extermination and how little the left has historically valued individual lives.